Beautiful Incentives: Close To Home 6 Month Reynolds Wrap Real Moms Giveaway! Close To Home 6 Month Reynolds Wrap Real Moms Giveaway! Listen up! Are you a diva in the kitchen? Do you cook a lot? If so, you probably use up a lot of tinfoil, special papers and baggies, among other things. I love to cook and I know I run out of those things quick! 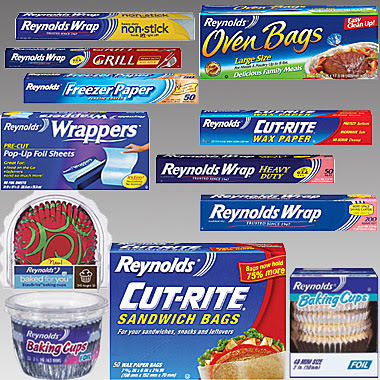 Well, here's your chance to win a ton of Reynolds Wrap Supplies! Times: Sun March 17th 12 am and ends on March 28th at 11:59pm. So you did not win the 6 month supply of Reynolds Wrap Giveaway from Close to Home earlier in the month. SURPRISE....Close to Home gets to give another reader a 6 month supply of reynolds products. Who is jumping for joy?? Another perk of being a contestant for the Reynolds Real Mom's Contest. While we do not know exactly what you will be receiving in your prize package, one winner will be receiving a 6-month supply of Reynolds Wraps products. This includes foil, parchment paper, baking cups, slow cooker liners, oven bags, bakeware pans, freezer paper, pan lining paper, etc. So many great products you will love them all. You will be receiving a box of products so have some space to store these goodies. Also remember to become a fan of Reynolds Kitchens on Facebook to get updates on the Reynolds Real Moms voting process as well as great tips. There are 2 more weeks for voting and there are some great tips being shared by the bloggers that are all moms. Be sure and go to the Reynolds Facebook page every Wednesday to vote for your favorite Reynolds Real Mom, Of course, Maria Long from Close to Home would gladly accept your vote..
Also if you get a chance check out these great Video Tips for using Reynolds Wrap Products shot by Maria. GOOD Luck and enter the rafflecopter below. This contest is limited to US residents. Disclosure: I did not receive compensation for this publication. My opinions are my own and may differ from those of your own. Beautiful Incentives is not responsible for sponsor prize shipment. This event is sponsored by Reynolds Wrap Products and Close to Home. Most of the foil I use is for snack items and dinner items, like pizza rolls, breaded chicken, or garlic bread. I use a lot of parchment paper too since we love cookies in this house! To remove grease- line a bowl with foil and pour the grease into it. When it hardens just lift out the foil and throw it away. No more trying to wash a dish or pan that had grease in it and worrying about it also clogging your pipes. Unique? Cats HATE it! I wrap stuff I don't want them to claw in foil to keep them away until they learn.